Today I'm catching a train into L.A. to meet up with Faith/Activism Collective to visit an immigrant family living in Sanctuary. "How will the Church respond to a broken U.S. immigration policy that is separating families? FAITH/ACTIVISM COLLECTIVE is partnering with the New Sanctuary Movement and Clergy and Laity United for Economic Justice (CLUE) to bring college students to the Pledging Sanctuary Churches that are housing and protecting immigrant families that are in their deportation process. 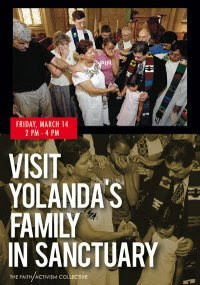 Part of the visit we will be sitting down with Yolanda and listening to her story on how she ended up going into sanctuary and learn ways that we can support Immanuel Presbyterian and the New Sanctuary Movement. WHAT IS THE NEW SANCTUARY MOVEMENT? It is a coalition of interfaith religious leaders and participating congregations, called by our faith to respond actively and publicly to the suffering of our immigrant brothers and sisters residing in the United States. We acknowledge that the large-scale immigration of workers and their families is complex. It is rooted in historical, global and economic causes that cannot be answered with simplistic or purely reactive public policy solutions. We represent Catholic, Jewish, Muslim, and Protestant denominations from across the county and from diverse communities, reflecting a multi-racial, multi-ethnic coalition spanning the political spectrum. I am sure I will be posting some thoughts about the experience after I get back. I am only learning what the New Sanctuary Movement is all about, but if you want to learn about it you should browse this site.